user-interface. 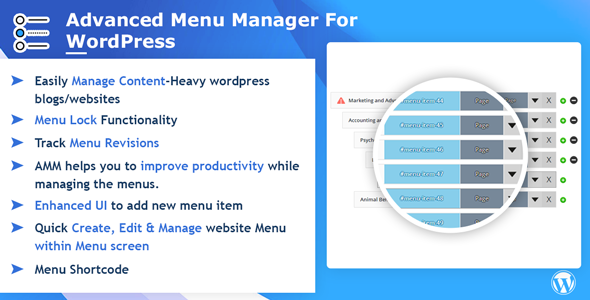 Besides offering a complete picture of your menu, the clutter-free UI also allows you to view, add, edit and manage your pages and posts to make your job easier. Easy search option of page/posts specially when you have hundreds of pages/posts. Detailed view of pages/posts including page id, slug, author name, template names etc. Filter pages/posts which are already there in your menu. You can create new pages within the menu without leaving your add menu item screen. in case you made a mistake while editing the menu, you do not need to worry. You can always restore your entire menu back from previously stored revisions. Use this feature to copy your menu structure. Just copy and paste the code in the page/post where you require. The same menu shall appear in that page/post. Using this feature you can lock particular Menu for other users. This feature can be handy when you want to restrict other admin users from editing the main navigation of your site. If you have many admin users in your wordpress site, and you want sure that not everyone can edit the main menu. Only selected users can change the main menu. In that case you can utilize the Menu Lock Functionality. Add, edit, manage and delete pages from a single interface, no going back to pages and posts section to create menu items. Add a menu item as a child category without going back and forth. Next, simply drag the item to make it a sub-item. No scrolling down to find the item and dragging it all the long way.This helps minimize your efforts and chance of human error. Easy to use page/post search functionality so that you know you have selected the correct menu item. View and compare previous menu revisions made. You can even restore to a previous version. You can Edit page/post within Menu by post content editor.